Two family members passed from the cancer crud. And more have had it and made it through. This month I’m growing my first ever moustache for Movember to raise awareness and help cancer research. As you can see from my pic, the stache is growing in a little thin and a little slow. And that’s like my D&D campaign now. My players are super-busy with overtime at work and family stuff and holidays. So we’re probably not going to game now until next year. We’ll see. 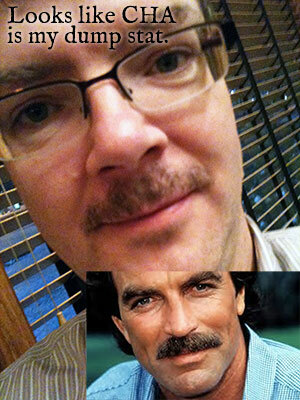 Meantime, please consider donating to my Movember campaign. My wife says the stache is coming off at 12:01 December 1, but your contributions will live on much longer than that. I’d like to update the plain text archives as an early Christmas present for you. In the past I’ve made all the issues plain text and available as a free and quick download to you. You can import these into your software or reader of choice and browse at your leisure. However, I have 132 or so issues trapped in HTML only format, and don’t have the time to strip the HTML and clean them up (preserve the spacing, clean up artifacts, etc.). If you would be interested in helping, send me a note. than one path to the top of the mountain. Want to design your own combat missions, fully tailored to the people, places, and things of your campaign? Today you’ll learn how to do this, including what design questions to ask and answer along the way. Let total annihilation scenarios take a back seat while you light a fire under your combat creativity. Why Create Your Own Missions? Ever have your players look up and ask why they’re fighting their enemy? Because a steady diet of “kill ’em all” scenarios gets repetitive, causes players to lose focus, and eats up a lot of session time. Now it’s time for us to explore these topics in more detail and design our own engaging combat objectives. When you create your own missions, ask and answer the following questions. This exercise will help you fill out your custom Combat Mission stat block. What areas of the battlefield offer key positional advantages? Examples: higher ground, cover, magical phenomena that provide buffs. What areas of the battlefield are particularly dangerous? Examples: pits, bridges, rock slides, smoldering fires, toxic vegetation, or gas clouds. What items or creatures on the battlefield are most valuable to either side? Examples: prisoners, escape routes, treasure hoards. How intelligent is the enemy? Smarter enemies use trickier tactics. For example, they’ll be more mindful of exits in the area and employ focus fire on the most threatening party member, such as the most effective damage-dealer, most powerful healer, or leader of the group. What is the typical behavior and ecology of the enemy? How do these creatures fit in the world? In your campaign, bandits and goblins might tend to have some kind of civilized code, while orcs and ogres tend to be more savage and blunt in their approach. Use behavior and ecology to guide foe decisions and add flavor to their combat actions. Why is each side fighting? How does this fight tie into current quests and adventure goals? 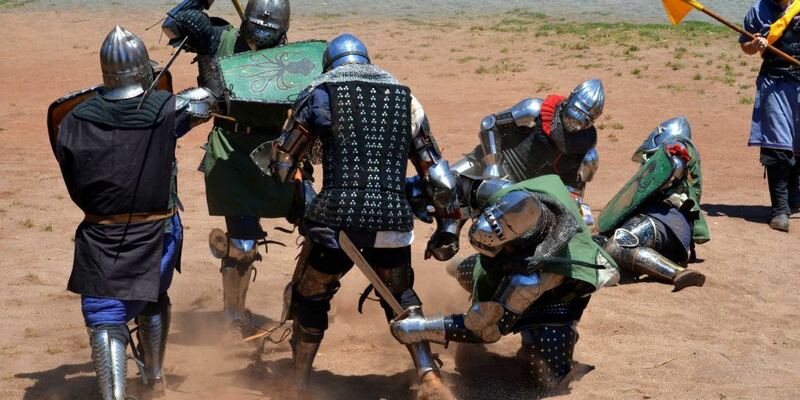 What events led to this combat? Why is each side engaging in combat? What do they hope to gain and what do they have to lose? Who is each side working for? What benefactors, authority figures or power groups are behind the scenes? How do they treat the party or monsters? How loyal is each group to the cause behind the combat and adventure? Now that you’ve identified key areas of the battlefield and explored monster and party motivations in the context of your adventure, it’s time to translate that information into the Combat Mission Stat Block. Refer to last week’s lesson on 5 Combat Mission Templates for detailed examples to guide you through the Mission Stat Block creation process. Give your combat a relevant and exciting name that includes reference to your world or adventure’s key people, places or things. Identify the specific combat mission with a word or short phrase. Your custom mission type should include an action word (see below for details) – the party must do something. More specifically, the party must do something besides kill everything in sight. Example: Tergyn’s Haunted Shrine: Hold the Line. Identify at least one end condition for success. You expand your mission type name or action word here by fully defining it. Identify at least one end condition for a failed mission. Here you make it clear what triggers a mission failure. Failure often means a time limit is reached, such as in the Escape Destruction mission. Failure can also mean the mission has changed or the objective is no longer achievable, such as when monsters with a valuable magic item escape the battlefield in the Acquire mission. Identify monster types and roles that match up well for your mission. Do the same for features of the area, such as terrain and furnishings. Add as much detail to the opposition as you like to further tailor encounter elements to your campaign, including key NPC names, for example. Identify the monsters’ thought process and priorities in the fight. Summarize how you expect the combat to play out – movement, attack effectiveness, typical actions in combat – given the impact of the Mission. Add at least one surprise or wrinkle to the mission. Borrow ideas from other missions and combine them, or add an event that changes priorities or plans after mission success or failure. You can also refer to your twists in case your current combat encounter is falling flat in actual play. Twists serve as backup plans and surprises to delight your players and keep combat pacing and excitement high. Now that we’ve gone over the basics of creating your own Combat Missions by using Combat Mission Templates, let’s see if we can create a bunch of templates – a bunch of mission types. I’ll be running a contest soon where you’ll send in your own template designs. Stay tuned to your inbox for details. Meantime, I have a bunch of great prizes lined up for you. Check them all out on the prizes page! I’m running two groups through a jungle at almost the same time. Have you ever published jungle encounters? The closest I can find is your list of 150 wilderness encounters (which is printed in my 5 inch 3 ring binder, lol, almost as hard to find there as the original email). Thanks for the email. Unfortunately, I haven’t done any jungle lists. A lost colony of high elves who have devolved. Friendly or not? Dear RPT Reader, I think it would be awesome to flesh this list out to 50 or even 100. Do you have any ideas for jungle encounters? I’ll add your ideas and republish the full table in an upcoming issue. Think back on past jungle adventures you’ve run or books and movies you’ve encountered with jungle scenes. Any ideas come to mind? Trying to protect your old-school RPG materials can be a pain, but I’ve found the perfect solution: Office Depot Expandable Sheet Protectors. 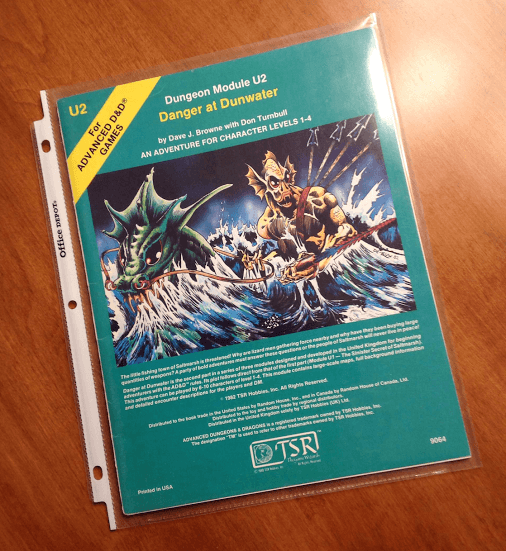 Unlike normal sheet protectors, which are overly snug and can even snag or rip the spine of a classic D&D module, these protectors are a bit wider than normal and can easily accommodate 50 pages of material. See the photo here with one of my modules stored nicely inside. Just the thing to allow me to organize my material into 3 ring binders! I still have a great deal of trouble completing prep. I run games that are fairly low prep to begin with (e.g., Savage Worlds), and I don’t have trouble coming up with seeds, and I’ve even digested ideas like using Fronts and such to make prep easier. But after I get a few bullet points down on the page I just kind of churn endlessly without actually turning it into anything. Assuming I’d like to keep running games that require some prep, and that I’m not an amazing improv GM, what things can I do to get around whatever writer’s block I’m having. Thanks! Use a pre-written module. Or just borrow heavily from it. Making smaller steps might help. Try to not plan too far into the future of your player characters, but look more at immediate story goals. Consider that improv GMing can be practiced. Just try it, make some notes about the situation, interesting places and people or even points of optional side quests before playing, then try to implement those points if fitting. I agree about the module, but I also like to focus on a single NPC and go from there. Maybe it’s the big bad, or maybe just the local barkeep. What did they do today? What messed with their plans? What about their family? Once I start down that path I usually find some interesting branches popping up. If not, I pick another NPC and try again. Even if it doesn’t work out as actual plot info, the time doesn’t feel wasted because I spent time fleshing out NPCs. I usually do a test run of my seeds and see where they lead me. Most of the time that just happens in the back of my mind when I’ve had some ideas and not yet time to put them on paper, and my mind just runs with it and comes back with cake. You might need a bit more time and effort, if it doesn’t come as natural to you. Take a seed, think about how your players might run with it, and see what the end result could be. It won’t necessarily be what happens, but you’ll have another node to plant another seed. To keep organized, you could use a graph. Put down a seed as a node and then think about what could happen. For example, your seed is “the players meet a band of orcs.” The players could decide to fight, so you create a new node that’s called “fight with the orcs” with a line you label “fight. Or they could choose to run, so you create a node “flight from the orcs” and connect it with a line called “flight. Maybe even use arrows instead of lines, to make the direction clear. From the node “fight with the orcs”, you can leave with two lines: “win” and “lose”, which lead to different nodes describing what happens. And so forth. I think you get the picture. You should easily see where there might be a hole in your prep you need to fix. You might also find multiple ways to get to key elements in your campaign. This isn’t supposed to be railroading though. If your players go for an idea you didn’t plan for, roll with it, even if it’s hard at first. Allow yourself to say, “Guys, you’ve kind of thrown me a curveball here, give me 10 minutes to figure this out.” If some ideas don’t get used the way you planned them, you can often easily reuse them. Doing this will train you in thinking along multiple ways a story can go. And the more you do it, the better and faster you’ll get at it. Doing bullet-points on a traditional sheet is not the best for creativity. In speed-reading class (Evelyn Wood method) they taught us a different way to take notes using tree-structures. There were different structures depending on the purpose. In creating story, take one sheet of loose-leaf and make a 1″ circle in the middle. Put the title of your game in it. Then draw 5 or 6 branches radiating out from it. These represent the “chapters” of the adventure you plan to make. What are the main steps the characters must do to succeed, to lead to a big showdown? Write in the titles of each section along the LEFT side of the branches that you made. Rotate the paper clockwise as you fill in each title. You can make horizontal branches, but they must project only towards the RIGHT, never the left. And short notes or descriptions can only be written BELOW a horizontal branch. This is because you will make new vertical sub-branches pointing up, and again you write notes along the left side of these new branches. Rotate the paper to keep the principal vertical branches pointing up. Adventures should be designed in a top-down approach, going from major divisions of the story down into smaller time-steps and finer notes about what happens in each step, always branches pointing up (radially from the center) and right. You can even make arrows across the whole structure to link any two points you care to make. If things get too cramped, you can zoom any vertical branch by using a new sheet of paper. Instead of making a circle in the middle, draw a line from the bottom left corner of the paper at an angle slightly right of vertical, all the way to the top. Then put your side-branches to the right as usual. This structure is superior to point-form because it gives you a visual memory of the whole adventure at once. Ideas will be slow at first, but as you sub-divide they will go faster and faster, and you will have no trouble filling in the space. Often you will have to make new sheets to expand the small branches and detail them on the points. Because of the bird’s-eye view of the plotline, I have run games reading off this structure, but some preparation of NPC sheets on scratch-paper, or short verbal flavour-paragraphs to recite to the players is still recommended. I like to make my first radial branch the introductory events the player characters see. And the second branch is the hidden back-story of individual NPCs or political factions who interacted in a certain way leading to bad or confusing situations the PCs come across, and that the PCs have to unravel what happened in the remaining chapter-sections, aid the good guys, and confront the bad guys in the thrilling climax. I write to get around writer’s block. Seriously – nothing lubes me up like the act of writing. So if I have nothing else, I usually just start writing down what I already know, or describing what my major NPC thinks and what he might do. Once I get writing the ideas usually start flowing of their own accord. Do you have any tips or advice on the concept of ships as dungeons? How to run entire adventures in such confined spaces? Where to get ship maps or mapping tips for ships? Types of events and encounters you might have? If you have any tips or ideas along these lines, please hit the reply button. I’ll share your advice with RPT readers in an upcoming issue.